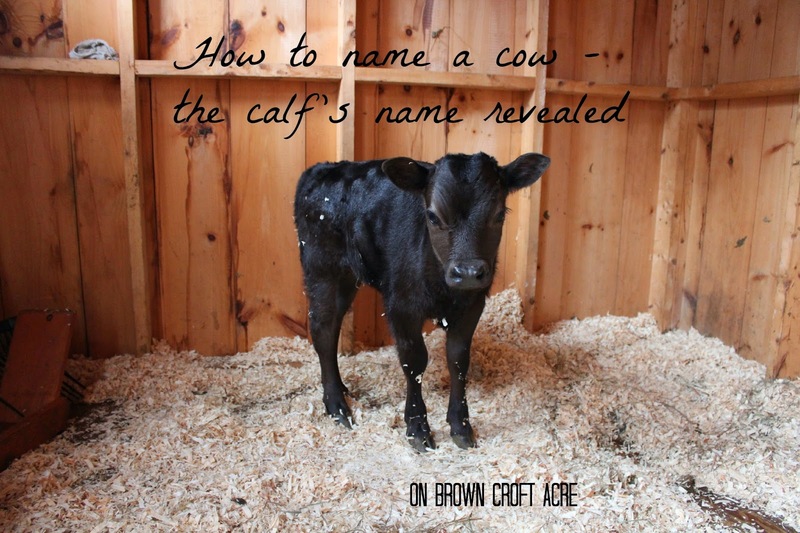 We had a hard time naming our little calf. Some people can’t name the animals they are going to eat. I do understand that naming them might cause more attachment, but we think we’ll be alright. We plan to love all the animals here personally and that’s easier for us if we can talk to them and call them by name. Our meat is going to have a good life here. First establish what the cow is for. Sale? To raise as a milk cow? As an oxen? As a Bull? Or as meat? - so ours is meat. Can’t be too personal. Have to remember it will be in the freezer. Look up popular names for cows. The extra step for a meat animal: Picture yourself sweetly calling the steer to the fence for a treat. Then picture yourself declaring any of those names as being in your freezer. - Wow, (Calvin, Mr. Moo, Norman, Wilbert, Sir Loin) gave us a lot of meat this year. Okay, so how did that go? All of those names seemed too creepy to me. It's probably just because it's my first time. And maybe because a lot of those names sound like a great uncle, twice removed's name. Giving our first steer a real human name like Calvin, Norman or Wilbert seemed odd. I can’t talk about “Norman” in the freezer. It had to be a nonchalant name that just rolled off the tongue. Original, I know. But he’s a sweet guy now, and if feels like it’s just a nickname. He’ll learn it, and come to it. And we’ll love Buddy. But he’ll also be useful to us and I can imagine commenting on whether or not we had a good yield from “Buddy”. I’m sure the name that is comfortable will be different to everyone. To some, Buddy would be too endearing. But I use nicknames a little differently. It’s just a friendliness thing, not necessarily something I do just for favorites. Maybe I'll get better at naming animals in the future. I was drawing a huge blank on names. Meat or not, I think naming animals is harder than naming humans. I attempted to take a video of Buddy. But Buttercup wanted to take all the attention.